This page contains pictures and information about Spittlebugs of family Aphrophoridae that we found in the Brisbane area, Queensland, Australia. 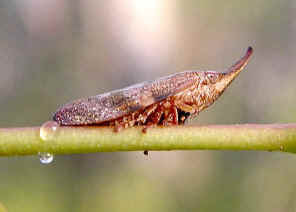 The insects in this family are known as spittlebugs because their nymph produces 'spittle' clinging to the stems of shrubs or small trees. They live immersed in masses of those liquid. It is believed that this will reduce the risk of dehydration or/and to deter parasites. Those spittle is sometimes known as cuckoo-spit. 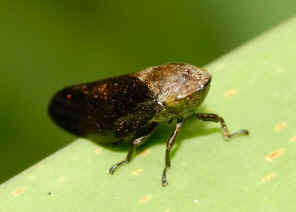 The insect adult has a narrow curved horn on the front of the head. Its is brown in colour. This Spittlebug in common in Brisbane bushes. 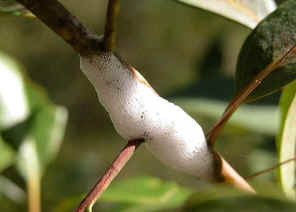 Their nymphs produce 'spittle' clinging to the stems of shrubs or small trees to reduce the risk of dehydration or/and to deter parasites. Those spittle is sometimes known as cuckoo-spit. we have more pictures and information in this page. Pictures were taken in Yugarapul Park Nov 2008. 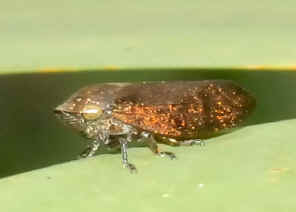 The Black Spittlebug is dark-brown to golden-black in colour. It has a speed-boat shape head. More information can be found in this page. 1. Insects of Australia, CSIRO, Division of Entomology, Melbourne University Press, 2nd Edition 1991, pp 468. 2. Family Aphrophoridae, Spittlebugs - Fletcher, M.J. and Larivière, M.-C. (2001 and updates). 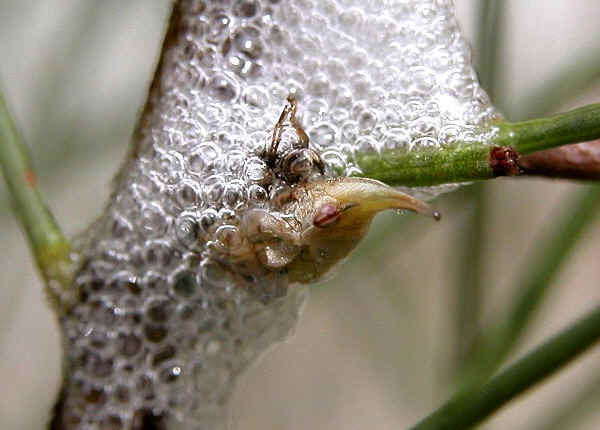 3. Review of the Australian aphrophorid spittlebugs (Hemiptera: Aphrophoridae) - Liang, A.P. and Fletcher, M.J. (2003), Australian Journal of Entomology 42(1): 84-93. Last updated: July 20, 2009.